Whether you know Skylar Grey from her songwriting work with insanely popular artists like Eminem and Rihanna (remember "Love the Way You Lie"?) or completely obsessed with her 2013 release, Don't Look Down, there are plenty of good reasons to love the "Wreak Havoc" musician. With her latest feature on the Suicide Squad soundtrack, and a new record, Natural Causes, coming out on September 23 (yes, today—pre-order here!) the Wisconsin native is about to embark on a 12-date tour bringing her new tracks to cities like New York, San Francisco, and Detroit. Before she hit the road, though, we caught up with Skylar about everything from salt and vinegar chips to Atoms for Peace and Band tees. 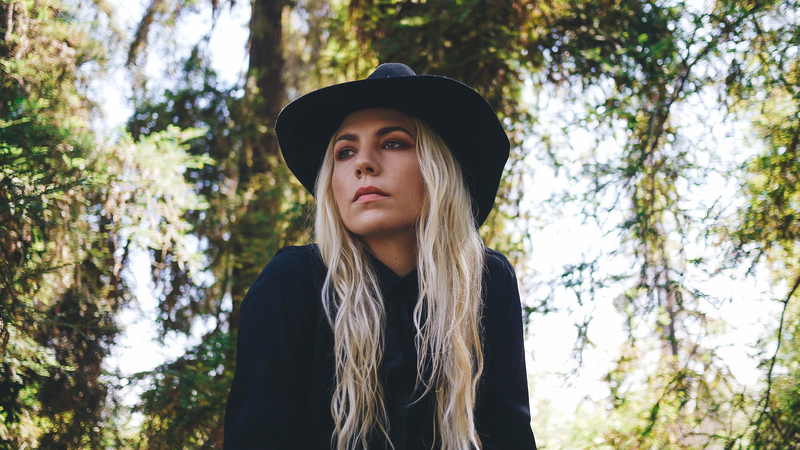 Read more in our interview below, but first we need to let you in on a little secret: If you Track Skylar on Bandsintown and RSVP to one of her shows, you'll get a surprise! We can't tell you exactly what it is, but we can tell you, it's awesome. So, you originally grew up in Wisconsin, right? Where did you go there to see shows and what was your first concert? I would have to go to Madison, because I grew up in a really small town, Mazomanie. We didn’t even have stoplights, so I had to drive into Madison to see music. There was a big jazz scene there, and I actually got into it a little bit—like sitting in with some jazz bands and musicians and stuff. So my first concert was a band from out-of-town, Alison Krauss & Union Station. And it blew my mind. It was amazing. Out of all the artists that you’ve worked with, have you had the chance to see any perform live that've really impressed you? I’ve seen Eminem and Rihanna perform. Perform the song you wrote? Yeah, I’ve seen them perform it multiple times. Once at V Fest, then obviously the Grammys. I’ve seen Kaskade—he’s got a crazy light show. Off of your new album, which song are you most excited for fans to hear live? Well I’ve played some of these songs live on the last two tours already, and obviously people didn’t know the songs because the music wasn’t out yet, but I still got to see the way the crowd reacted to the songs, and it’s really fun to play “Straight Shooter,” so I’m looking forward to playing that one again. Also, I’m excited to play “Wreak Havoc” off The Suicide Squad soundtrack because I haven’t performed that before, and it’s full of energy—and I’m rapping, so that’ll be a fun one to do. So, you’re visiting some of what I think are like the best cities in America on this tour. Which one are you most excited for, specifically for the food? You mentioned with your new album, you wanted it to be something that could sit alongside your favorite records while you’re driving through a beautiful place. Which records do you see it sitting beside? My favorite artists are Radiohead, Kendrick Lamar, and Bon Iver, so those are my favorite albums to listen to anytime. Especially when I’m alone and driving. I guess I made my album—I don’t feel like it compares to those masterpieces—but just kind of with those in mind as far as inspiration musically. It sounded amazing, and everybody was wild onstage. I’m not a huge fan of crazy productions with visuals. Obviously you need to have some visuals, you need to have some lights to set a mood and all that stuff, but, one thing I learned from watching Alison Krauss as a young kid was the musicianship and the songs and everything carried the show. You didn’t need any theatrics, and sometimes bands spend too much time and money on theatrics and not enough time with the music and making it really beautiful and impressive that way. And so, Alison Krauss was a great example of that, but then Atoms for Peace, again, the musicianship was crazy, the performing was crazy, the amount of energy was crazy. Flea on bass, it was insane. So, all of that, it didn’t need extra bells and whistles to be my favorite concert.